The British Virgin Islands is a British overseas territory, located in the Caribbean to the east of Central America. The 36 islands are of volcanic origin, with the exception of Anegada, which is a coral atoll. The U.S. Virgin Islands (St. John, St. Thomas, and St. Croix) were once part of the territory, but were purchased by the U.S. from Denmark in 1917. The islands extend east-west for 60 miles and are located just west of the Anegada Passage, a major channel connecting the Caribbean Sea to the Atlantic Ocean. The Islands, with a population of 22,000 (2005 census), have one of the more prosperous economies of the Caribbean region, along with one of the lowest unemployment rates in the world. Their main industry is tourism, based upon their ideal location, climate, and overall enjoyable environment. The British Virgin Islands are comprised of 36 semi-tropical Caribbean islands, ranging in size from the largest, Tortola, approximately 12 miles by 3 miles, to tiny uninhabited islets. 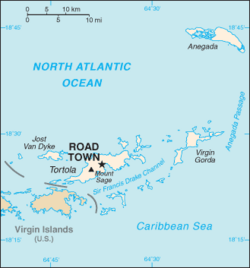 The four main islands are Tortola, Virgin Gorda, Anegada, and Jost Van Dyke. They are located in the Virgin Islands archipelago which forms the northeastern extremity of the Greater Antilles, and are to the immediate northeast of the U.S. Virgin Islands. The Atlantic Ocean surrounds the islands on the north and east, while the Caribbean Sea lies to the south and west, with the island of Puerto Rico also to its west. In addition to the four main islands other, smaller islands include: Beef Island, Cooper Island, Ginger Island, Great Camanoe, Great Thatch, Guana Island, Moskito Island, Necker Island, Norman Island, Peter Island, and Salt Island. Of the 36 islands in the group, 20 are uninhabited. An extension of the central mountains of Puerto Rico, the islands form a geological unit with Puerto Rico and the Greater Antilles. Of volcanic origin overlaid with limestone, they have a variety of physical features. Most of them have a hilly, rugged terrain, except for Anegada—the only coral atoll in the group—which is fairly flat. There are low–lying mountains, lagoons with coral reefs and barrier beaches. Harbors tend to be landlocked. The islands have strong ties with the nearby U.S. Virgin Islands as well as with Puerto Rico. The British Virgin Islands comprise an area slightly smaller that the U.S. District of Colombia. The total area of the colony is 59 square miles (153 square km), with 48 miles of coastline and a maritime claim of 3 nautical miles, and 200 nautical miles of exclusive fishing zones. 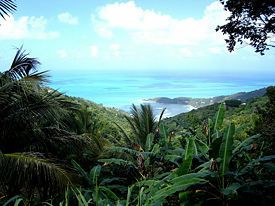 Its highest point is Mount Sage on the island of Tortola, at 1,709.3 ft above sea level. There are no rivers on the islands and natural resources are negligible. Twenty percent of the land is considered arable. Agriculture consists of various fruits, vegetables, livestock, and poultry. The British Virgin Islands enjoy a tropical climate, moderated by trade winds. Temperatures vary little throughout the year. In the capital, Road Town, typical daily maximums are around 90°F in the summer and 84°F in the winter. Typical daily minimums are around 75°F in the summer and 70°F in the winter. Rainfall averages 45 inches per year, and is higher in the hills and lower on the coast. Rainfall can be quite variable, but the wettest months on average are from September to November and the driest months tend to be February and March. Hurricanes occasionally hit the islands, with the hurricane season running from June to October, and are seen as the only natural hazard to the area. 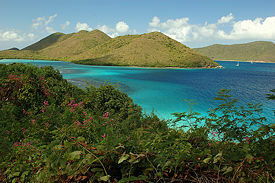 View of the British Virgin Islands from St. John. The first European sighting of the Virgin Islands was by Christopher Columbus in 1493, on his second voyage to the Americas. Columbus gave them the fanciful name Santa Ursula y las Once Mil Vírgenes (Saint Ursula and her 11,000 Virgins), shortened to Las Vírgenes (The Virgins), after the legend of Saint Ursula. The Spanish Empire acquired the islands in the early sixteenth century, mining copper on Virgin Gorda. Subsequent years saw the English, Dutch, French, Spanish, and Danish all jostling for control of the region, which became a notorious haunt for pirates. During the process of colonization the native American Indian population was decimated through disease and mistreatment. The Dutch established a permanent settlement on the island of Tortola in 1648. In 1672, the English captured Tortola from the Dutch, and the British annexation of Anegada and Virgin Gorda followed in 1680. Meanwhile, over the period 1672–1733, the Danish gained control of the nearby islands of St. Thomas, St. John, and St. Croix. The islands were considered principally a strategic possession, but were planted when economic conditions were particularly favorable. The British introduced sugar cane which was to become the main crop and source of foreign trade, and slaves were brought from Africa to work on the plantations. The islands prospered economically until the growth in the sugar beet crop in Europe and the United States significantly reduced sugar cane production. In 1917, the United States purchased St. John, St. Thomas, and St. Croix from Denmark for U.S.$25 million, renaming them the U.S. Virgin Islands. Subsequently, the British renamed the islands they controlled as the British Virgin Islands. The British Virgin Islands were administered variously as part of the Leeward Islands Colony or with St. Kitts and Nevis, with an Administrator representing the British Government on the Islands. Separate colony status was gained for the Islands in 1960, and the Islands became autonomous in 1967. Since the 1960s, the Islands have diversified away from their traditionally agriculture-based economy towards tourism and financial services, becoming one of the richest areas in the Caribbean. Executive authority in the British Virgin Islands is vested in the royal monarch of United Kingdom and is exercised by the Governor of the British Virgin Islands. The Governor is appointed by the Monarch on the advice of the British Government. The Defense and Foreign Affairs remain the responsibility of the United Kingdom. The Constitution of the Islands was introduced in 1971, and made by an Order in Council under powers granted by the West Indies Act of 1962. Ratified in 1971, it has been amended many times, first in 1979, then in 1982, 1991, 1994, and 2000. A new constitution was made in 2007 (the Virgin Islands Constitution Order 2007), and will come into force on the next date when the Legislative Council is dissolved for a general election. The Head of Government is the Chief Minister, who is elected in a general election along with the other members of the ruling government as well as the members of the opposition, much like the United States presidential elections. An Executive Council is nominated by the Chief Minister and appointed by the Governor. There is a unicameral Legislative Council made up of 13 elected members who serve four-year terms. 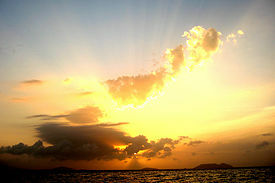 Sunset in the British Virgin Islands, April 2007. The British Virgin Islands enjoys one of the more prosperous economies of the Caribbean region, with a per capita Gross Domestic Product (GDP) of around $38,500 in a 2004 estimate. The 1995 unemployment was 3 percent, one of the lowest in the world. The economy consists mainly of what is termed the "twin pillars"—tourism and financial services, though light industry is also important. Politically, tourism is the more important of the two pillars, as it employs a greater number of people within the Territory, and a larger proportion of the businesses in the tourist industry are locally owned, as are a number of the highly tourism-dependent sole traders, such as taxi drivers and street vendors. The islands are a popular destination for U.S. citizens, with around 350,000 tourists visiting annually. Tourists frequent the numerous white sand beaches, visit The Baths on Virgin Gorda, snorkel the coral reefs near Anegada, experience the well-known bars of Jost Van Dyke, or charter yachts to explore the less accessible islands. Economically, however, financial services is by far the more important. Nearly 50 percent of the Government's revenue comes directly from license fees for offshore companies, and considerable further sums are raised directly or indirectly from payroll taxes relating to salaries paid within the trust industry sector (which tend to be higher on average than those paid in the tourism sector). Substantial revenues are also generated by the registration of offshore companies. As of 2004, over 550,000 companies were registered. In 2000, KPMG reported in its survey of offshore jurisdictions for the UK government that over 41 percent of the world's offshore companies were formed in the British Virgin Islands. Since 2001, the Islands' financial services have been regulated by the independent Financial Services Commission. Agriculture, once the backbone of the islands' economy, accounts for only a small proportion of the GDP. Agricultural produce includes fruit, vegetables, sugar cane, livestock, and poultry. Some crops are exported, but most are grown for local consumption. Commercial fishing is a growing industry and fresh fish have become a significant export. Industries include rum distillation, construction, and boat building. Cottage industries produce woven baskets and other items that appeal to the tourist trade. Since 1959, the official currency of the British Virgin Islands has been the U.S. dollar, also used by the U.S. Virgin Islands. The British Virgin Islands are a major target for drugs traffickers, who use the area as a gateway to the United States. According to the Foreign & Commonwealth Office, drugs trafficking is "potentially the most serious threat to stability in the BVI." Being a small group of islands, transportation is limited, with only 70 miles of roads (in comparison there are more than 100 miles of park trails in New York City). The main airport, Terrance B. Lettsome International Airport also known as Beef Island Airport, is located on Beef Island, which lies off the eastern tip of Tortola. Virgin Gorda and Anegada have their own smaller airports. The main harbor is in Road Town. The 2005 census showed a population of just over 22,000. The majority of the population (83 percent) are African-Caribbean, descended from the slaves brought to the islands by the British. Other large ethnic groups include those of British and other European origin. As of a 1999 census report 7.3 percent of the population was white, originating from Great Britain, Portugal and Syria/Lebanon. Also living on the Islands are mixed heritage peoples (5.4 percent), East Indian (3.14 percent), and less than one percent of other ancestry. The islands are predominantly Protestant Christian at 86 percent. The largest individual denominations are Methodist with 33 percent, Anglican at 17 percent and Catholic with 10 percent. 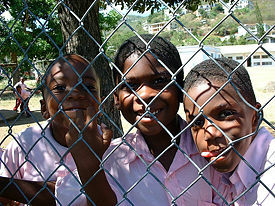 Happy and healthy schoolchildren in Roadtown, Tortola, March 2001. Virgin Islander culture is syncretic, based primarily on African and European cultural influences. Though the Danish controlled the present-day U.S. Virgin Islands for many years, the dominant language has been an English-based Creole since the 19th century, and the islands remain much more receptive to English language popular culture than any other. The Dutch, the French, and the Danish also contributed elements to the island's culture, as have immigrants from the Arab world, India, and other Caribbean islands. The single largest influence on modern Virgin Islander culture, however, comes from the Africans enslaved to work in canefields from the seventeenth to the mid-nineteenth century. These African slaves brought with them traditions from across a wide swathe of Africa, including what is now Nigeria, Senegal, both Congos, Gambia and Ghana. The music of the Virgin Islands reflects long-standing cultural ties to the island nations to the south as well as to various European colonialists. Though the U.S. Virgin Islands and British Virgin Islands are politically separate, they maintain close cultural ties. From its neighbors, the Virgin Islands has imported various pan-Caribbean genres of music, including calypso from Trinidad and reggae from Jamaica. The traditional music of the British Virgin Islands is called fungi after the local cornmeal dish with the same name, often made with okra. The special sound of fungi is due to a unique local fusion between African and European music. It functions as a medium of local history and folklore and is therefore a cherished cultural form of expression that is part of the curriculum in British Virgin Island (BVI) schools. The fungi bands, also called "scratch bands," use instruments ranging from the calabash, washboard, bongos and the ukulele, to more traditional western instruments like the keyboard, banjo, guitar, bass, triangle and saxophone. Apart from being a form of festive dance music, fungi often contains humorous social commentaries, as well as oral history. There are Virgin Islander institutions that support and promote the islands' folk heritage. Bradley Christian's St. Croix Heritage Dancers, for example, are folkloric group, one of several quadrille ensembles that offer a "compact, staged rendition" of folk traditions, along with educational narration. Music education in the Virgin Islands is primarily based around the Western classical tradition, particularly orchestral and concert band music. Local folk music is also a part of the music curriculum; quadrilles are taught in schools in St. Croix, and Charlotte Amalie High School on St. Thomas is home to a well-known student scratch band. ↑ Foreign and Commonwealth Office, British Virgin Islands (British Overseas Territory) North & Central America and Caribbean (23 November 2011). Retrieved January 17, 2012. ↑ Central Intelligence Agency, British Virgin Islands The World Factbook. Retrieved January 17, 2012. ↑ The World Factbook, CIA publications. Economy: British Virgin Islands. Retrieved October 24, 2007. ↑ UK Foreign & Commonwealth Office, British Virgin Islands Country Profile. Retrieved October 24, 2007. ↑ Dale A. Olsen and Daniel Edward Sheehy, The Garland encyclopedia of world music. Volume 2, South America, Mexico, Central America, and the Caribbean (New York: Garland Pub., 1998), p 968-974. Pearson Education. British Virgin Islands. Retrieved October 24, 2007. United Nations Decolonization Unit, Department of Politcal Affairs. Non-Self-Governing Territories listed by General Assembly in 2002. Retrieved October 24, 2007. Government Site. Government of the Virgin Islands (U.K.). Online Tourist Guide. The British Virgin Islands Welcome Tourist Guide On-line. Sea Transportation of BVI. The British Virgin Islands Ports Authority. Regulatory Financial and Business Services. British Virgin Islands Financial Services Commission. News Page. B.V.I. Platinum News. News Page. BVI News Online. Local Newspaper. The Island Sun. British Virgin Islands Paradise Islands. History of "British Virgin Islands"
This page was last modified on 25 June 2016, at 18:35.